Sonic the Animation (sometimes referred to by fans as Sonic: Man of the Year) is a short Sonic the Hedgehog cartoon developed by TMS Entertainment (known at the time as Tokyo Movie Shinsha) in conjunction with Sega AM3 in 1994. It appears within Sonic Jam, which was released 3 years after the short was created. According to the Sonic Jam Official Guide, the short has apparently played in some theme parks, among other places. While the intentions of Sonic the Animation have never been clear, it is suspected that the piece was created as an experiment, combining traditional hand-drawn cel animation by TMS with 3DCG backgrounds by AM3. Another short, Sonic Ride was likely produced for similar reasons (although there, everything is comprised of CGI). The short starts with the song Morning Mood by Edvard Grieg playing in the background and the camera panning over to Dr. Eggman's hideout - an island covered in scrap metal with a statue of himself in the center. 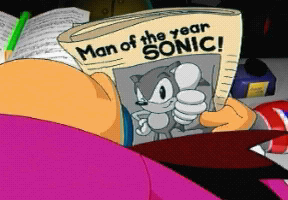 Eggman, having just woke up, spots Sonic the Hedgehog in the paper, having just won the "Man of the Year" award. The song In the Hall of the Mountain King by Edvard Grieg starts playing in the background as Eggman rips up the paper and throws it at a TV screen where Sonic is on TV. Furious, he takes his anger out on a stuffed Sonic toy, before coming up with a new idea. The scene then changes to the city, where Eggman has created himself a Sonic costume, and begins to terrorise the residents to the theme of Sonic CD's Metallic Madness (JP/EU). After creating a mess, Sonic is then given the "Worst of the Year" award, and when the real Sonic the Hedgehog arrives, he is booed by the public as Eggman watches from above laughing. The short ends on a cliffhanger with "TO BE CONTINUED" shown on the screen but no sequel has been made, most likely due to it merely being an experimental demo.